Eurocell Modus uPVC windows revolutionised the window industry with the UK's first fully integrated flush sash window system. Modus windows and doors simply look stunning, offering high performance and fantastic value for money. The sleek modern design of Modus windows is also available with a slim sash or standard sash option, ideal for period or contemporary replacement windows and new build housing. We manufacture Smart Aluminium Windows for both domestic and commercial installations. Elegant slimline frames and a wide colour choice make aluminium windows a popular choice with homeowners. Our windows also match our range of aluminium bifold doors and aluminium sliding doors. Frame Fast Eurocell uPVC casement windows are chosen by the trade and house developers for their high quality and big choice of styles and options. With bevelled and ovolo frame options, our uPVC casement windows offer the versatility to suit any property style. We provide Astragal bar, mock sash horn and arched frames for heritage and period house styles. uPVC tilt and turn windows offer a practical option for homeowners, commercial properties and high rise buildings. Tilt and turn windows open inwards to offer your customers a stylish, easy to clean window that is safe at height and ideal where the outside space is limited. Our tilt and turn windows feature slimline frames made from Eurocell Eurologik thermally efficient profiles. They offer a stylish solution and can be fully opened inwards, making it easy to clean both the inside and the outside of the frame and glass. Our Heritage Windows offer you a stylish range of designs and finishes to satisfy homeowners looking for Georgian windows or the look of traditional sash windows, with all the benefits of low maintenance uPVC. Our Eurocell Georgian windows are authentically styled with colour matched astragal bars and simulated divided light glass units, providing your customers the traditional period look they want to achieve. Frame Fast's uPVC sliding sash windows provide the perfect option for homeowners wanting to replace old timber sash and poor imitations from the 1970's and 80's. They offer all of the benefits of a modern uPVC window, with all the charm and character of authentic sash windows. We have kept a close eye on detail and recreated all the traditional features. Frame Fast manufacture high quality Smart Systems aluminium bifold doors, so you can offer your customers an easy to use, reliable and great looking door. Our aluminium bifold doors are quick to install and excellent value for money. Slim sightlines, easier opening and high security locking mean our aluminium bifold doors bring the space, comfort and low maintenance luxury your customers will enjoy. Frame Fast manufactures Aspect uPVC bifold doors, the advanced system from Eurocell. With ultra-slim frames and large glazed panels, you can offer your customers a stylish, high-quality and easy-to- use bifold door. Whether you're working on a new build property, an extension or a refurbishment, our aluminium sliding patio doors come in a range of colours and finishes to suit any type of project. Our aluminium patio door system is easy and quick to install allowing you to move onto your next project as quickly as possible, without compromising on a high-quality installation. You can offer your customers a lot of choice with our range of uPVC French Doors. As well as our stylish bevelled and ovolo frame designs and colour matched hinges, we also manufacture Modus French Doors in a choice of colours and finishes that truly impress homeowners. With stunning colour options and infinite door designs uPVC Residential Doors give your customers a lot more choice for their front door or back door. As well as the traditional panel door designs with plain or decorative glass, we offer an extensive range of colours, finishes and styles to complement the style of any property. Frame Fast manufactures high quality Smart Systems aluminium bifold doors, so you can offer your customers an easy to use, reliable and great looking door. Our aluminium bifold doors are quick to install and excellent value for money. Frame Fast has been working with architects and construction professionals for 20 years, so we've a wealth of experience in making sure our window and door products achieve the aesthetics and performance that a project demands. We are used to working from architect plans and can assist at specification stage with CAD drawings, size and thermal calculations. Roof Fast is Frame Fast's expert conservatory roof manufacturing division. Set up in 2000 to give installers a dependable, high quality conservatory roof supplier, Roof Fast conservatory roofs now make a wide range of bespoke trade glazed and tiled conservatory roofs and skylights. Our specialist Roof Fast division manufactures the innovative Eurocell Skypod Skylight system. The modern alternative to aluminium skylights and conservatory roofs, Skypod offers a contemporary designed skylight that is very energy efficient and looks great with slimmer sightlines to let in more light. Eurocell Equinox solid conservatory roof is a highly versatile solid, highly insulated roof system that creates more opportunities to improve existing conservatories or build a new living space. Frame Fast manufactures both uPVC bifold doors and aluminium bifold doors. Both our styles of bifold doors bring real benefits to any installation. They are easy to install, great looking and have superb security and energy efficiency. Our Eurocell Aspect uPVC bifold doors and aluminium bifold doors from Smart Systems bring the outside in with wide panels of slim framed glazing. We manufacture high quality Smart aluminium bifold doors, with beautifully slim frames for narrow sightlines and a bigger glass area. These reliable aluminium bifold doors are also easier to install. Frame Fast manufactures the advanced Aspect uPVC bifold doors system from Eurocell. With slim frames and large glazed areas, our uPVC bifold doors are easy-to-use for homeowners and provide real quality and style. Our aluminium bi-fold doors are delivered fast. 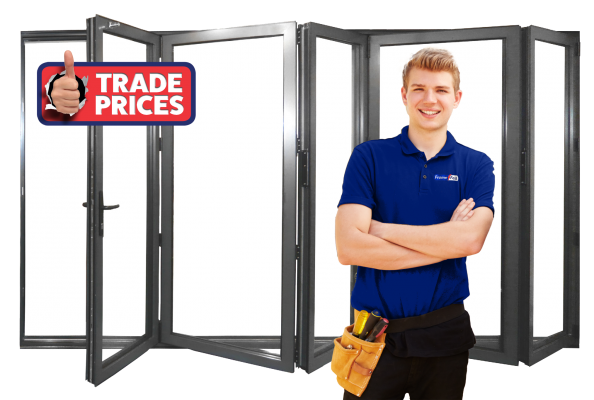 Get an instant price for your perfect bi-fold doors using our bi-fold door quote builder. Need more information about any of our bifold door products? Talk to our trade experts today on 01332 344459 or visit our showroom today. Talk to one of your local sales team who can explain in more detail what we can do for you.